See the review at SuperPhillip Central! More than a decade ago, UK based developer Rare was working on multiple projects for a little handheld from Nintendo known as the Game Boy Advance. When Nintendo decided not to buy Rare founders the Stamper brothers' shares of the company, Microsoft purchased the company instead. 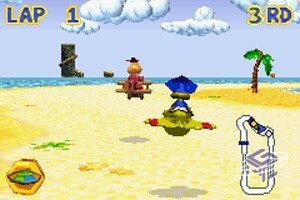 Rare still had several unreleased projects for the GBA, including games like Banjo-Kazooie: Grunty's Revenge and a racing game featuring Diddy Kong and his friends, Diddy Kong Pilot. 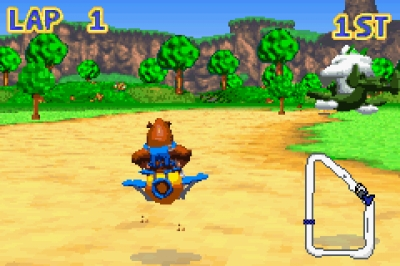 Banjo Pilot forgoes the typical karts that are so popular in games of the arcade racing style, and instead it takes to the sky with every character racing in miniature airplanes. 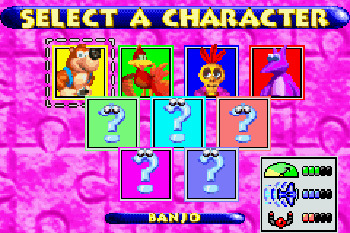 Starting off, Banjo, Kazooie, Mumbo Jumbo, and Jinjo are unlocked as racers. Through completing cups, new racers are available to purchase with pages delivered back to Cheato, earned through finishing races. Typical of these kinds of games, there are sixteen tracks total in Banjo Pilot. These range from trips to worlds from Banjo-Kazooie, Banjo-Tooie, and even Banjo-Kazooie: Grunty's Revenge, the bear and bird's first arrival on the Game Boy Advance. Tracks range from familiar locales like Spiral Mountain, Treasure Trove Cove, Freezeezy Peak, Gobi's Valley, Witchyworld, and more. However, despite the different venues of the tracks, all of them pretty much sport the same obstacles, such as trees on the track (or a rare camel instead) and boost rings that give a jolt of speed to whoever flies through them. Flight really doesn't change too much in the way races play out. There is the occasional aforementioned boost ring that is at a different height than the last, requiring moving upward, but for the most part, it's a basic novelty and nothing more. 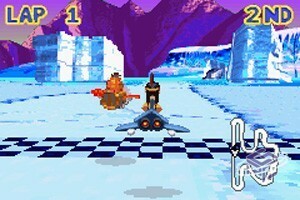 Since you can fly, you might wonder how you're forced to stay on the track, since this is a Mode 7 game. There are no walls on the tracks to prevent you from going off course, but with that said, merely flying over a section of ground that isn't the track will slow you down immensely, eventually causing you to crash. 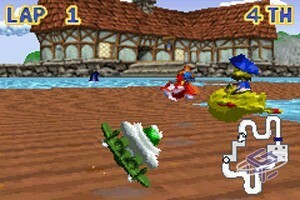 Items are a traditional part of kart racers, and Banjo Pilot really does nothing to separate itself from the pack here. There are a pair of shoes that give a temporary speed boost when used, a golden feather that serves as invincibility for a limited time, fire red homing eggs, and ice eggs that leave a frozen ice cube in the air that will significantly slow down anyone that collides into it, among other items. For items on your trail, you can utilize an ice egg to block the attack, or you can opt to make like Peppy Hare and do a barrel roll. Though this takes a proper amount of timing to get down, doing it correctly will result in a boost. Alongside the Grand Prix mode is a mode called Jiggy Challenge, where you're tasked with collecting six golden jigsaw pieces sprinkled along each track, as well as needing to beat an AI racer at the same time. With 32 tracks to do so, 16 standard tracks and 16 reversed, this is a mode that will take some time to complete, but the reward (the best character in the game) is well worth it.